Doug Jenks is a Director with Auman, Mahan & Furry. He represents employers in industrial accidents, focusing on workers' compensation and OSHA defense. He also handles general business litigation and insurance defense claims. Mr. Jenks is a member of the Ohio and Dayton Bar Associations, and is Chair of the Dayton Bar Association’s Workers’ Compensation Committee. He speaks to industry groups regarding workers’ compensation and OSHA matters, and presents at various continuing legal education seminars. Mr. Jenks also writes and publishes articles on these topics. He has been recognized as an Ohio Super Lawyer Rising Star. He holds a Bachelor of Arts degree from Wittenberg University, a Master of Arts degree from Duquesne University, and a law degree from the University of Dayton. He is a member of Leadership Dayton and is the President of the Board of Trustees at the Miami Valley School. Mr. Jenks can be reached at dsj@amfdayton.com. 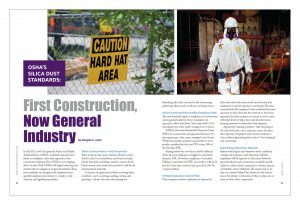 In fall 2017, new Occupational Safety and Health Administration (OSHA) standards imposed strict limits on workplace silica dust exposure in the construction industry. But, OSHA is not stopping there. In June 2018, OSHA will begin enforcing very similar rules for employers in general industry. These new standards are stringent and employers must quickly implement procedures to comply or risk citations and significant penalties. Silica is the second-most common element on the Earth’s crust. It is everywhere, and found in many jobsite materials, including concrete, cement, brick, block, mortar, man-made stone products, wall board, and insulation materials. Common occupational activities involving these materials—such as sawing, sanding, cutting, and grinding—release silica into the atmosphere. Breathing silica dust can lead to life-threatening pulmonary illness such as silicosis and lung cancer. The new standards apply to employers in construction and in general industry whose employees are exposed to silica dust above “the action level” of 25 micrograms per cubic meter averaged over 8 hours. OSHA’s silica dust Permissible Exposure Limit (PEL) for construction and general industry is 50 micrograms per cubic meter averaged over 8 hours. While this number probably means little to most people, consider this: the new PEL is just 20% of the old silica PEL. Staying below the new limit could be difficult. After all, some employers struggled to stay below the prior PEL. However, compliance is essential: Failing to stay below the PEL can result in a $12,675 fine for a first time citation, and up to $126,749 for a repeat citation. First, employers whose employees are exposed to silica dust above the action level must develop and implement a written exposure control plan. The plan must describe the employers’ work activities that cause exposure to silica dust; list the methods to limit that exposure; describe measures to restrict access to areas with high levels of silica dust; and describe housekeeping measures to limit silica dust exposure. Apparently cleaning activities—like sweeping at the end of the day—are a common source for silica dust exposure. Employers must devise methods to clean without generating dust, such as “wet sweeping” and vacuuming. Before work begins and whenever work conditions change, the employer must determine whether employees will be exposed to silica dust. Both the general industry and construction standards specifically list 3 silica-based compounds to beware: quartz, cristobalite, and/or tridymite. The easiest way to do that is to review Safety Data Sheets for the materials on the jobsite to determine if they contain one or more of those silica compounds. Remember that exposure may come from other employers on a jobsite. Regardless of the source of the exposure, all employers are expected to protect their employees from silica dust. If employees will be working with materials containing quartz, cristobalite, and/or tridymite, they must assess the amount of silica dust being generated to determine whether dust controls are required. The assessment must occur before work begins and whenever there is a change in the work activity. There are 2 methods to assess the amount of respirable silica dust: “the performance option” or “scheduled monitoring.” The performance option gives employers flexibility to determine the possible silica dust exposure by using any combination of air-monitoring test data and/or objective data. Objective data means information, such as air-monitoring data from industry-wide studies that closely resemble the employers’ current operations. Alternatively, employers can assess silica exposure through scheduled monitoring. Under this method, employees wear equipment to monitor any silica dust exposure, which must be sent to a lab to determine the exposure, if any. This method is not real-time monitoring like the performance option, and does not involve any objective data. If the employer determines that employees face silica dust exposures above the PEL, employers must use engineering controls to reduce the exposure below the PEL—unless those controls are not technically feasible. Engineering controls include water, which can be introduced to various practices to liquefy silica dust, or vacuum procedures to capture silica dust before it becomes airborne. Equipment manufacturers will increasingly offer tools designed to help employers comply with the OSHA silica dust standard, like drills with built-in vacuum attachments. If engineering controls do not reduce the exposure below the PEL, the employer must supplement those measures with respirators sufficient to lower the exposure below the PEL. These standards are somewhat unique in that the employer may only use personal protective equipment, like a respirator, as a control measure on top of, and not in place of, engineering controls. For some employers, utilizing “Table 1” may be the easiest way to comply with the new silica dust standards. The silica standard for construction includes Table 1, which lists 18 common construction tasks commonly involving silica containing materials. If a construction employer’s jobsite activities involve materials containing quartz, cristobalite, and/or tridymite, they can refer to Table 1 to determine whether those jobsite activities are listed there. If the jobsite activity is listed in Table 1, employers need only follow the instructions there to limit the potential silica dust exposure. There is no need to do any assessment or measuring to determine the amount of breathable silica dust on the jobsite. For example, if an employer is using a stationary masonry saw to cut brick (containing silica), Table 1 tells the employer to simply “use saw equipped with integrated water delivery system that continuously feeds water to the blade.” Provided the employer can do so, that is the only measure necessary to comply with the standard. However, Table 1 does not appear in the general industry standard. Nonetheless, general industry employers may follow Table 1, but only if their task is “indistinguishable from a construction task listed on Table 1.” Also, if a general industry employer follows Table 1, then that employer must follow the remainder of the construction standard. The general industry standard requires employers to establish regulated areas where and when an employer reasonably suspects that an employee’s exposure to silica dust will exceed the PEL. The employer must post warning signs marking the regulated area, and must restrict access to only those employees who are required to be there. Those entering the regulated area must have a respirator sufficient to reduce exposure below the PEL. Employers must also offer medical examinations to employees who will be exposed to silica dust, at or above the action level, for 30 or more days within the year. Medical examinations are intended to identify silica-related diseases, identify any underlying condition that might make an employee sensitive to silica dust, and determine the employee’s fitness to use respirators. The employer shall provide free periodic medical exams every 3 years as well as any referral to a specialist. Employers covered by the silica standards must also inform employees about silica dust hazards and the methods the employer uses to limit their exposures to those hazards. Employees must be trained before they are exposed to silica dust at or above the action level. Specifically, employees must know and understanding the following: health hazards associated with exposure to silica dust, tasks that could result in exposure, measures to protect employees from exposure, the contents of the OSHA silica dust standard, and the purpose and description of the medical surveillance program. Employers are also required to keep records regarding silica dust. Record keeping is also a very good way to demonstrate employer compliance when facing an OSHA inspection. Specifically, employers must keep records of air-monitoring data, objective data relied on for compliance, and medical surveillance. The employer must make and keep accurate records for each employee provided medical surveillance under the standard. The silica standards require employers to keep exposure records (including air monitoring and objective data) for at least 30 years. They must also maintain medical records for at least the duration of the exposed employee’s employment, plus 30 years. 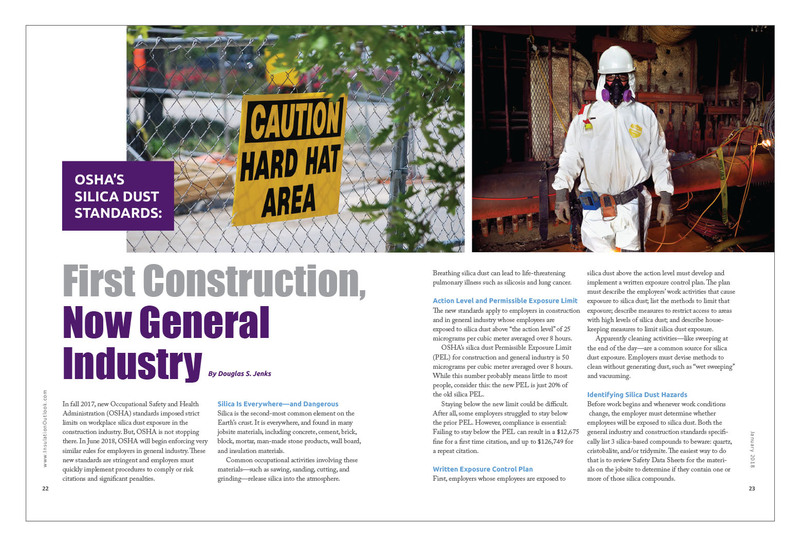 The OSHA silica dust standards for construction and general industry are extremely demanding. The best place to start may be with an occupational safety and hygiene consultant who can do the initial monitoring to determine whether these standards even apply. Please keep in mind that this article is a broad overview of some of the new requirements. Employers should take a few moments to carefully read the construction industry silica standard found at 29 CFR 1926.1153, and the general industry silica standard at 29 CFR 1910.1053. Both can be found at osha.gov. It is important to ensure you are compliant with all the new requirements in order to avoid penalties and citations.